"Mr. Inside" is a metaphor, pointing to that bitter place in our hearts where we live in fear and anger, holding the sovereign God responsible for life's unjust events. The author demonstrates that the root of anxiety and the quest for control actually center around ones anger toward God ultimately being in charge. Mr. Inside is a fictional, fast-paced suspense documentary of how one man, through circumstances beyond his control, comes face-to-face with his interior enemy. In 1947, brothers Gustov and Andy Miller witness a traumatic event involving their missionary/pastor parents. The young boys return to America, drift apart, and each enters adulthood carrying the memories and scars of that fateful event. By the early 1970s Dr. Gustov Miller, now an internationally renown scholar of Archaeology, Anthropology, and History, has developed a keen sense of solving ancient mysteries and has established his own company called Lost & Found International. He runs his company with only two employees, his assistant, a lovely Christian woman, Miss Beatrix Peeters and James Morrison, his "Mr. Outside," who finds himself in life-threatening situations while searching for lost or stolen artifacts, under the remote direction of Dr. Miller who keeps himself tightly secluded inside his mansion. Suddenly, uninvited guests violate Gus' control center, demanding that a certain valuable, ancient parchment be surrendered. The action-packed story-line includes Gus and Jim being hounded by scoundrels, beaten, and thrown off a moving passenger train--all while risking death in their quest to rescue a kidnapped friend. The invisible hand of God is seen in riveting clarity as it affects the lives of the characters. A page-turner, Mr. Inside entertains, engages, and impacts the reader in unexpected ways. Frank James is a pastor at Valley Springs Presbyterian Church in Roseville, CA, and holds an MFA degree in Theatre and Drama from the University of California, Los Angeles (UCLA). He is the recipient of numerous acting awards, including; the Elly Acting, Birdsal Acting, Robert Reed Acting, and Bank of America Best Actor. Frank is an accomplished playwright and has performed, directed, and toured with groups such as; Theatre Du Terte Paris, Last Minute Production (co-founder), Actors Alley Theatre, Long Beach Civic Light Opera, and Richmond Sheppard Theatre, Hollywood, among others. Mr. 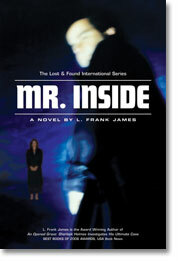 Inside is Frank's second novel. His first, An Opened Grave: Sherlock Holmes Investigates His Ultimate Case, is a highly endorsed, award-winning book.